It was a Christmas gift from my sister, Beth! Dancers are young when they first dream of dance. Siena was six — and her dreams kept skipping and leaping, circling and spinning, from airy runs along a beach near her home in Puerto Rico, to dance class in Boston, to her debut performance on stage with the New York City Ballet. To Dance tells and shows the fullness of her dreams and her rhapsodic life they led to. Part family history, part backstage drama, here is an original, firsthand book about a young dancer’s beginnings — and beyond. This book was a surprise present from my sister at Christmas time. 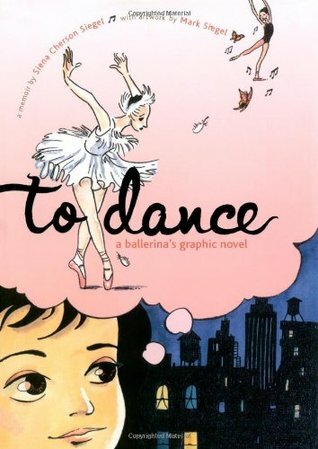 I have been getting into graphic novels recently, and dance is one of my favourite subjects to read about (and favourite things to watch) so she thought this book would be perfect for me. It’s such a cute graphic novel, telling the story of Siena’s (the author) dancing journey. To Dance is definitely aimed towards the younger reader (I’d say between 9-14) but I enjoyed it nonetheless! The illustrations and colour in this graphic novel are certainly beautiful. I did enjoy the story and think it tells a true story of how hard dance can be, but I don’t think it flowed as beautifully as it could have. I liked that it wasn’t a light story. Siena had a difficult time with her parent’s divorce and I think this was represented well. Many young people see ballerinas as beautiful (they are) but many imagine their lives to be perfect too and this isn’t the case for every ballerina! This is a perfect graphic novel for dance lovers!